A series of loud explosions has been heard in the centre of the Iraqi capital, Baghdad. The attack appeared to target the heavily-fortified headquarters of the US-led coalition, but so far there has been no word of any casualties. A BBC correspondent says flashes of flame filled the sky, and sirens were heard across the city. 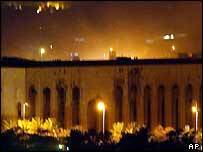 The explosions were close to the building where Iraq's new interim constitution is to be signed on Monday. The ceremony will bring together all 25 members of the US-appointed Iraqi Governing Council. The signing was called off on Friday because Shia leaders objected to some aspects of the new constitution. The BBC's Barbara Plett says that mortars and rocket-propelled grenades were fired at the coalition headquarters, with five rockets targeting the al-Rashid hotel, where a number of senior officials are based. "There was no confirmation of any injuries," said US Major John Frisbie. The so-called Green Zone is sealed off to the public and has been the target of a number of attacks. Several US aircraft were seen flying low over the Tigris River, possibly using infrared heat sensors to try to locate the rocket launchers used in the attacks. The Green Zone last came under attack last Wednesday, as the senior US official in Iraq, Paul Bremer, was about to brief the press on the attacks in Baghdad and Karbala that killed 170 people. The interim constitution is due to be signed unchanged, after Friday's delay in the face of objections by Shia leaders. Two IGC members, Mowaffaq al-Rubaie Rubaie and Ahmad Chalabi, held talks on Sunday with Shia leader, Ayatollah Ali al-Sistani, at his headquarters in the holy city of Najaf. "We are glad that the grand ayatollah understood our position," said Mr al-Rubaie afterwards. "[He] does not want to provoke a crisis in the country but, on the contrary, wishes to facilitate our work to make the political process succeed and without any interruption." Top US administrator Paul Bremer responded cautiously, saying it was too early to say whether the dispute had been resolved. There has been no word from other factions on the IGC. Ayatollah Sistani has repeatedly said the interim constitution should not deal with fundamental issues because it is being drawn up by an unelected body. His objections have exposed the depth of divisions over how power should be shared between Iraq's different ethnic and religious communities, our correspondent says. In particular, Shias objected to a clause that would give Iraq's ethnic Kurdish minority the right to veto a permanent constitution, due to be drawn up after elections are held. Another point of dispute is the make-up of the presidency. The draft agreement provides for a single president with two deputies. The Shias have been demanding a five-person presidency rotating between three Shias, a Kurd and a Sunni - giving the Shias a dominant role. 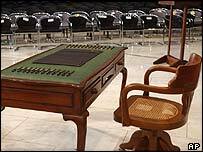 The constitution lays the foundations for direct elections before the end of January 2005. "Blasts light up the sky"